College is expensive and after losing their daughter's scholarship, Scott (Ferrell) and Kate (Poehler) decide to launch an illegal casino in the basement of their friend's house to raise money for her tuition. As with most comedies, the premise acts only as a vehicle for the shenanigans and farce of the situation, with the talented actors riffing and improvising. Alongside Ferrell and Poehler, Jason Mantzoukas, Nick Kroll, Ryan Simpkins and (in a jaw-dropping moment) Jeremy Renner join the cast, all helmed by comedy director and one half of the the writing team, Andrew Jay Cohen. While Poehler is easily one of my favourite comedians of the moment, Ferrell has never been my cup of tea, making the pairing an interesting one to say the least. Thankfully, Amy's natural charm helps dull the grating Ferrell's inclination towards the wide-eyed, over the top shtick he always gravitates towards; it is present here, but a little more digestible because of her. Unfortunately, the script does neither of them many favours at all and it is only by their natural talents that they get by here, creating some funny moments but nothing more. They often feel restricted by the characters who are one-dimensional as they come, fuelled only by Scott's poor mathematics skill, Kate's love for her daughter and... not a lot else. It is fair to say you don't come to a film like this for the character work and development, but The House barely even gets them off the ground. Ferrell and Poehler are wholly to thanks for their characters because the script pretty much gives up on them early on. Everybody else is decent enough, including Mantzoukas who brings a committed performance to the fold, including a genuinely shocking 'omg' cameo from Jeremy Renner (I would love to know how they swung that) but are facing an uphill battle with lacklustre characters and writing. Simply, many of The House's problems boil down to the script. I certainly chuckled a handful of times and did have a smile on my face for the most part, but nothing is memorable and I'm having a difficult time recalling anything noteworthy. Except for one scene that is enough to convince any director to give Amy Poehler a flamethrower in every single role she undertakes, it is oddly flat and uninspired through, lacking a sparkle that is imperative for a film like this - particularly one that sells itself on the name of its leads, in this case, two of the most popular comic actors working in Hollywood. It is utterly forgettable and the unfulfilled potential is damning, but in the moment it is a frothy, fluffy slice of light entertainment that scrapes through by the very skin of its teeth. Like a hangover after the type of night our duo host, you'll not remember much of it the next day. Andrew Jay Cohen does better as a director than as a co-writer. Thanks to some lovely production design (honestly, the casino is beautiful and the provider of some really great shots), he operates in a slick way that keeps the runtime at a merciful 88 minutes. Many would be tempted to have a comedy with two of the genres firecrackers as their leads overcook, dwelling on their improvisation and efforts, but Cohen knows when to restrict the film and crack on with things; the film wastes no time to start with either, jumping into the main narrative in just a couple of minutes, helping maintain that tight-ish runtime. Now, if only Cohen could have injected some life and excitement to pick things up every now and then: it just remains so flat throughout. With no disrespect intended, it is like an SNL sketch that runs on for far too long. It is a shame that The House never learns how to utilise its plethora of talent effectively. Ferrell and (particularly) Poehler are two of the most consistent comedians in the industry - no matter your personal view or interest in them - but even they cannot find much life here. The script is like an SNL sketch stretched out over almost 90 minutes, which would be fine if it provided our duo and their supporting players with some stronger gags, but it does not, leaving them to do the heavy lifting - and there's only so much you can do revolving around such a thin idea. But, with a film like The House, you should know what to expect, so if you temper your expectations appropriately, you can find some light, frothy entertainment in The House. 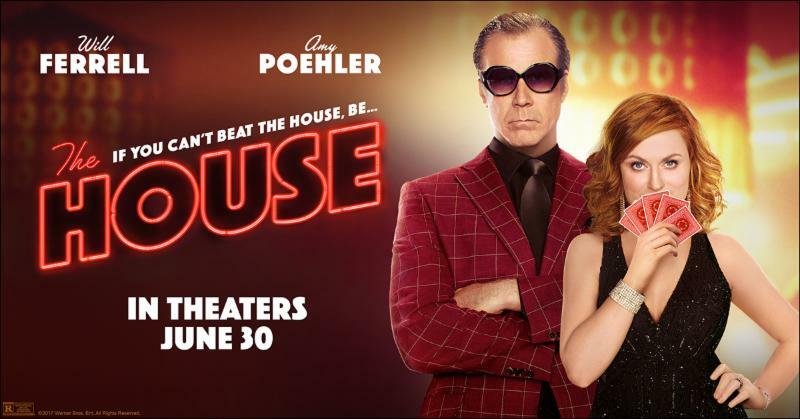 This Amy Poehler and Will Ferrell's double-hander is serviceable but there's nothing here to bring the house down. I'll see myself out. Summary: The House cashes-in because of the natural talent of its two leads but is an otherwise wasted opportunity. It's surprising flat but at a merciful 88 minutes, you can just about find enough to be entertained by in this frothy but forgettable comedy. Where has the time gone? It's been about a year since the 2017-18 award season was underway and the divisive discussions over Three Billboards Outside Ebbing, Missouri seems like a light breeze in comparison to the tornado of controversies agitating this especially brutal season. With every man, woman and child engrossed in the carnival of cinematic cheering dishing out predictions, I have assembled my thoughts on each of the major categories. Formulated through extremely basic industry analysis, award season patterns and, quite frankly, gut reactions, my predictions attempt to make sense out of a particularly perplexing year, set in stone so I can't fake a 'i knew that was going to happen!' reaction. It will entirely ignore what is and isn't eligible (beyond "released in 2018 in the US") because I make up my own rules. At the risk of sounding unappreciative, Laurel & Hardy's brand of comedy doesn't exactly tickle my funny bone. It is most certainly a generational thing: comedy, for better or for worse, has evolved massively since the double-act was indulging in the slapstick antics that won the world over and, despite my indifference towards them, there's no denying the impact they have had on the world of comedy. Jon S. Baird's biopic attempts to recapture the nostalgia so many felt towards the duo, telling the "untold story" of Stan & Ollie. 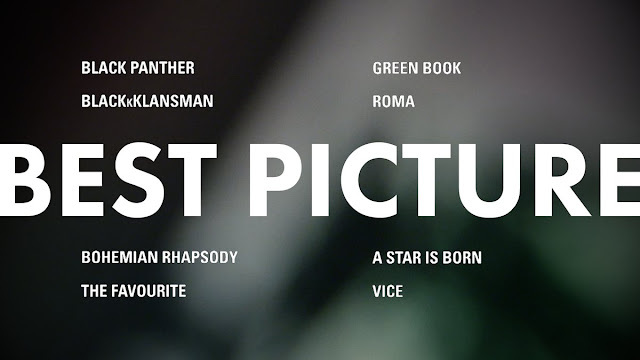 Before the Academy Awards tears apart Film Twitter tonight, I've joined forces with some of the finest souls in this Oscar-obsessed world to put some of the major categories under the magnifying glass, exploring who will - and who should - win in some of the most hotly-contested categories. I've taken in friend, sometimes foe Ryan Morris (formerly of Morris Movies) and together we're looking at the screenplays: Ryan's tackling Original Screenplay while I take on Adapted Screenplay. We recently spoke about films initially projected for award season greatness that arrived with an almighty thud and died a slow, painful death surrounded by the success stories it so wished to emulate. But not all once-contenders died such a death, with a handful teetering on the outskirts: not quite strong enough to set its eyes on the top prize but hoping to pick up a handful of nominations in more targeted categories. 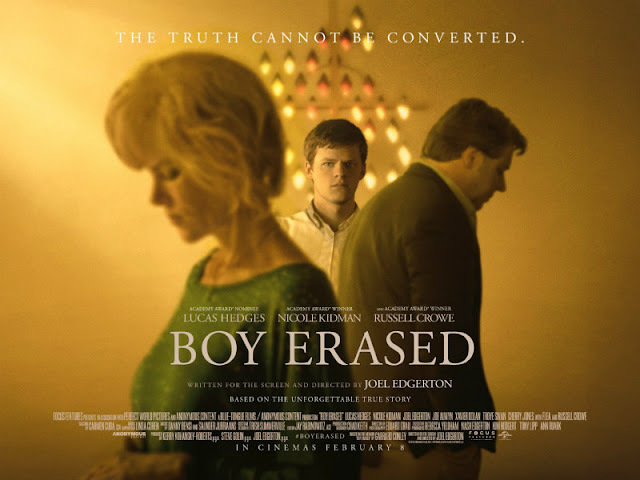 This year, Boy Erased joins the likes of Beautiful Boy, Widows, A Private War and Colette as pictures seemingly designed for award prestige but failed to secure a nomination on Oscar morning; Erased's two Golden Globe nominations - Lucas Hedges in Best Performance in a Motion Picture - Drama and Best Original Song for Troye Sivan's Revelation - ultimately failed to convert to recognition from The Academy and so becomes a faller at the final hurdle. No one would blame you for rolling your eyes when learning about a new screen interpretation of the King Arthur legend. While nobody was particularly asking for a fresh translation of the Excalibur tale, Joe Cornish's decidedly more family-friendly, fantastical take is a pretty solid effort indeed. The Kid Who Would Be King is a surprisingly uncynical and sincere slice of filmmaking for all the family to enjoy. When twelve-year-old Alex Elliot draws what is revealed to be King Arthur's sword from a stone in a nearby construction site, he awakens a wicked sorceress Morgana buried underground, who sends her minions after Excalibur. Inadvertently becoming the leader of the fight to stop Morgana from enslaving the whole of England, Alex assembles a team of friends and foes who, with the help of a student-disguised Merlin, try and prevent Morgana from returning before a solar eclipse grants her full access to her powers. To say that this is a divisive pack of Best Picture nominees is putting it lightly. In all honesty, I'd have specified just two - maybe three, given my admiration of my fourth-placed title - of the eight films ultimately nominated on my own imaginary ballot, compared to six of last year's batch. The sooner this award season is over, the better. However, despite the pain it inflicts upon the reminder of the superlative films like Can You Ever Forgive Me?, First Man, If Beale Street Could Talk, Widows and Hereditary that are disappointingly absent, I’m keeping with tradition and ranking the Best Picture nominees. Because who doesn’t love a ranking? Share your own with me and let’s hope one of my top two films win the award (for you, and my sake). An unrecognisable Nicole Kidman is haunted by the ghosts of her bullet-riddled, purple-painted past in Destroyer, where the air crackles with secrets and burns like the LA sun. Karyn Kusama's crime-drama-noir is a peculiar cross between mainstream and arthouse cinema but seemingly exists to neither: perhaps indicative of why the film has struggled to find its audience. That's rather disappointing because it's a genuinely terrific piece of filmmaking -- and one that perfectly lands one of the most shocking twists in a good while. LAPD detective Erin Bell (Kidman) is sent down a dark rabbit hole when a dye-stained dollar bill is sent to her, re-opening a decades-old cold case that fuels a mission of revenge. Co-starring Tatiana Maslany, Sebastian Stan and Toby Kebbell, Destroyer is more than just a great performance as the film claws under your skin and lodges itself there for the duration and beyond. This year more than any other, the value of 'worst of' lists has been endlessly debated and often criticised. Some see the lists as obnoxious, hatefully-bashing entities that spread negativity; others feel they need to get something off their chest. As you've probably figured with a post entitled '2018 in Film: Worst Of', I fall into that latter category because if a film has wasted my time, energy and resources, I believe I'm entitled to a little bit of a moan (it's what us British specialise in after all). As long as it isn't too personal - and I'd like to note now that everyone involved in the production of these misfires is capable of far better - then I think we're good to go.